I cannot claim to be a huge sports fan, I do not sit glued to the TV watching Football, Baseball, Hockey, or any of the favorite Sports that have become so ingrained in our society. 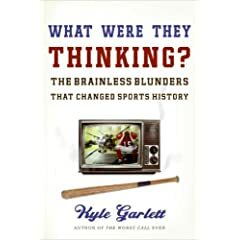 I do vaguely understand the rules, and yes, occasionally I see something happen that makes no sense, the title of Kyle Garlett’s new book What Were They Thinking, sums it up quite well. Kyle is a sports fan, and reporter, this new book is a collection of his top list of sporting blunders of the past 100 years. Some are shocking, some are funny, and some are just downright bizarre. One thing is for sure after reading this book, the human mind is a very strange thing. Kyle takes us through some of the strangest events in Football, Baseball, Basketball, and several other sports. One theme that trails through several stories is how we blindly believe in things that are not true. One story in particular that caught my attention was that of the San Diego Chargers and their new wonder boy Quarterback Ryan Leaf. I was living in San Diego at the time and remember this oh so well. The Chargers needed a new QB and the hot draft picks were Peyton Manning and Ryan Leaf. The Chargers with second pick in the draft felt they were in a win win situation, the Colts with prime pick selected Peyton Manning, the Chargers, happy as clams snapped up Ryan Leaf. Leaf was a disaster both on and off the field! He did manage to win the first two games that he participated in, but that was about it. His litany of mistakes could fill an entire book, yet the Chargers management kept putting him on the field. Off the field he clashed with team mates and his tangles with the media became a source of regular titillation in the local newspaper. Another of my favorite stories concerns a promotion put on by the Cleveland Indians in 1974. Attendance had been sluggish, averaging some 10,000 per game, some bright spark suggested that to promote attendance they should have a cheap beer night. At 10 cents a cup their dreams were realized, a sellout crowd of 25,000. Alas 24,999 were drunk as skunks. Streakers on the pitch, and a basic riot ensued, needless to say the game was abandoned. It is not just coaches and players though that get the spotlight in What Were They Thinking, Kyle also picks on a few members of the press. Sometimes they say and do the darnedest things. Kicking off the media section Kyle retells a delightful piece of urban legend from the 50’s concerning pitcher Dizzy Dean after he had become a broadcaster. How true the story is we may never know, but it certainly is amusing. As I stated I am not much of a sports fan but I did enjoy this book, Kyle Garlett has done a very good job of ferreting out some of the best stories. You can pick up your copy of What Were They Thinking from Amazon. 5 users commented in " Book review: What Were They Thinking? by Kyle Garlett "
I was watching the game on TV when Dizzy Dean made the observation about the couple kissing, “he’s kissing her on the strikes and she’s kissing him on the balls”. He and Peewee started laughing so hard it was minutes before they could regain their composure. That’s hilarious and probably a great gift for Dad. D. Durham thanks for the confirmation and added detail – good to start off Monday with a laugh. This is a true story. Not only was I watching the game on TV when it happened (I was about 10 or 11 years old at the time), but I heard a replay of it years later (in the 1970’s) on a bloopers tape.